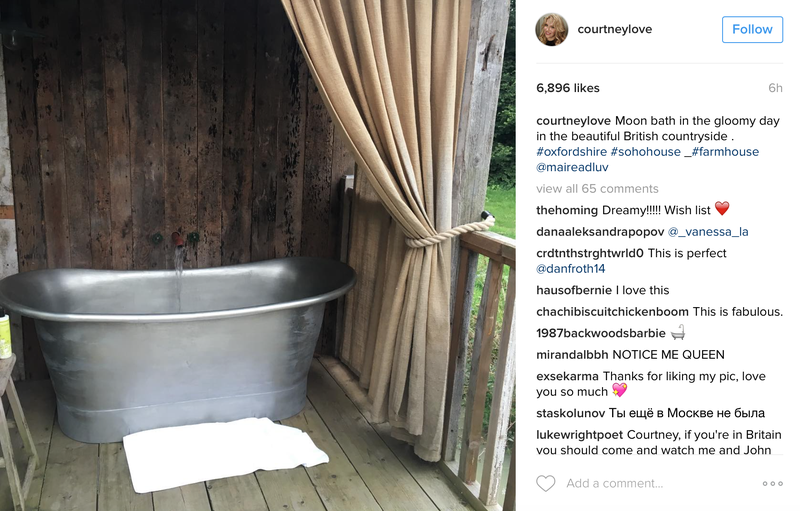 I don’t really get what moon bathing is, but Courtney Love’s Instagram is giving me aspirations that go well beyond the quickie post-blogging shower. Whilst vacationing in South England today, Love posted the above photo of a gleaming silver tub, which she referred to as her “moon bath.” Hello Giggles has keenly observed that Love was not merely plying her Instagram audience with poetic imagery but was also making reference to a genuine, documented beauty fad. Ok here’s the part where I try and fail to explain moon bathing to you. The basic premise is that, just as the moon pulls upon the tides, so too does it pull upon our bodies, because we are made of water. And stardust, lots of stardust. What’s most important is to take your bath when the moon is new or full, as this will impart to you certain benefits (the website I’m looking at right now lists two main ones: “healing” and, my favorite, “cleansing”). But the Internet also says you can take your moon bath anytime so long as you douse it in Himalayan salt. This is what it looks like when you are inside the moon bath (pictured: one of Love’s co-vacationers). While you’re not required to wreathe your head with flowers to enter the moon bath, it helps. If you tell someone you are going “moon bathing” they will probably assume you’re planning to lie down somewhere outside in the dark alone. Let them think it.